It’s a small world around here! We all keep bumping into each other, like at the Gig Harbor Night Market. (Left to right: Dr. Jamie Brooks, Michael Duggan, and Gretchen Duggan) Don't forget Katie Dean behind us with her beautiful prints! We at Duggan Homes with Dr. Jamie of Brooks Dental Studio are so happy to be partnering up to support literacy and access to books in our favorite city. Help us stock the Cushman Branch Little Free Library with all kinds of good books! Read about our book drive below. Throughout March and into April we’ll be coming to you every couple of weeks with a Little Free Library profile, an up close look at a particular library through the eyes of the caretakers. Our project will culminate in the sponsorship of 2 new Little Free Libraries for Tacoma. The Rotary Literacy Committee and Tacoma Community House are helping us identify areas with a need for greater access to books. We’re so excited! Special Delivery! Dr. Jamie and her son filling up the Hogan Family Community Library with books from our book drive. Sound good? We hope you have some books around that you’re ready to share. We thank you in advance! One of Tacoma’s beautiful Little Libraries, you’ll find the Cushman Branch on So. 9th & Cushman in the Hilltop Neighborhood. This Little Library was made with love by Chris Ferguson, a good friend of the Wong-Stroeh family. What’s a Little Free Library? Little Free Library is a nonprofit organization founded in Wisconsin in 2012, although it actually began in 2009 when Todd H. Bol built the first Little Free Library. Todd passed away in 2018, leaving a legacy of literacy. At the time of his death over 75,000 Little Free Libraries populated 88 countries! Here in Tacoma we’re part of that global community. Little Free Libraries are mini libraries outside homes. Folks can purchase kits, or design their own. Little Free Libraries are free to use, open to everyone. They’re here for all of us, and they’re meant to be used and shared! Visit the Little Free Library site to learn more about how it all started, explore a searchable map of local libraries, or register your own Little Library if you haven’t already. 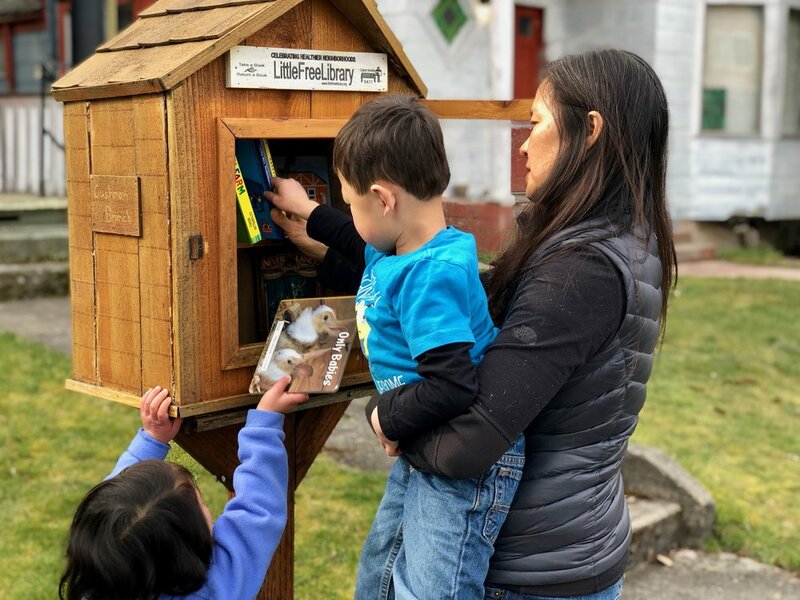 Meet Leigh Wong, proud Hilltop Tacoma resident and steward - along with her husband John Stroeh and their 2 kiddos - of the Cushman Branch Little Free Library. Leigh and the kids showed me some of the good books ready for readers in their neighborhood. Let’s add to the stash! Taking stock of the Cushman Branch and its inventory. Meet Leigh Wong. She and her husband John Stroeh, along with their family, are caretakers of a Little Free Library outside their home at 922 South Cushman Street. Raised in California, Leigh came to Tacoma by way of Vancouver, British Columbia. Leigh is an artist and a teacher, a gracious listener, a lover of community, and a hardworking mama! Read all about this Hilltop Neighborhood library below, then find out how you can support it! How long has your Little Free Library been open? If you read our last Little Free Library article, you might remember that Melo’s library has just been open for a few months. The community is growing! Image from LittleFreeLibrary.org. Leigh and John gathering with a group of neighbors to celebrate their Little Free Library. What inspired you to host a Little Free Library outside your home? Have you met anyone new because of your Little Free Library? On Leigh’s block they have reasons to say hello. She says, “Yes, we meet people who walk by when we are at our window or outside.” People stop and take a look at the library, and it’s a just anther reason to say “hello” or strike up a conversation. Has the Little Free Library changed or influenced your relationship with your neighborhood or the people on your block? These libraries are about more than just reading material; this is Little Libraries creating connection and building community! Do you notice any “favorite” kinds of books for your neighborhood? A free community library with upside-down books. What’s not to love? What are your wishes for your Little Free Library, or your vision for its purpose or influence? How can the Tacoma community support your Little Free Library? Leigh says it’s time to talk to their library designer about maybe adjusting the shelves to accommodate books of varying sizes. Also, she notices there’s quite a bit of maintenance needed to keep the library in good repair. Right now the knob for the door is missing! She also has more thoughts about how we can support the Cushman Library with reading material. “We put a lot of board books in there for wee ones and they were gone quick. I love children's books! And also maybe new best sellers? It would be great to stock it with great reads.” Let’s get on that! Look for bins with this label at Brooks Dental Studio and Windermere Abode! This is where you come in! Any books you love, find interesting or valuable, and are ready to share are more than welcome. Let’s keep filling those libraries. Thanks so much for the book drive contributions coming in so far! Any book you love and would like to share! Don’t feel limited by the list, it’s just a way to get ideas going. So let’s start collecting for the book drive! Dr. Jamie of Brooks Dental Studio is ready for you to fill up this Collection Bin! Brooks Dental Studio is on Antique Row and just below colorful Opera Alley. Drop off some books, then browse the vintage shops, or head toward S. 9th for coffee at Bostwick Cafe, or a treat at Original House of Donuts - then brush those teeth! Bring your books down to the Windermere Abode office in beautiful Old Town and say “hi” to Michael! Saturday: we often have a realtor on duty, so we’ll let you know via Instagram and Facebook if it’s a good Saturday to drop off some books! Book drive pick-up! If you need us to drop by for your books, just let us know. Windermere Abode is in Tacoma’s beautiful Old Town, just a block up from the Old Town Dock﻿ on the Ruston Way Waterfront. Drop off some books, then take a walk on Ruston Way, or head across the street to The Spar for cocoa, coffee, or delicious Spar Chips! In the coming weeks we’ll be featuring another Tacoma Little Free Library and its caretakers. We can’t wait to share more stories, and update our book drive wish list. Just let us know if you have any questions about donating books. We look forward to seeing you around Tacoma! Newer PostThe April Edition: 22 Tacoma Events!